Click on each clock for an enlarged image. 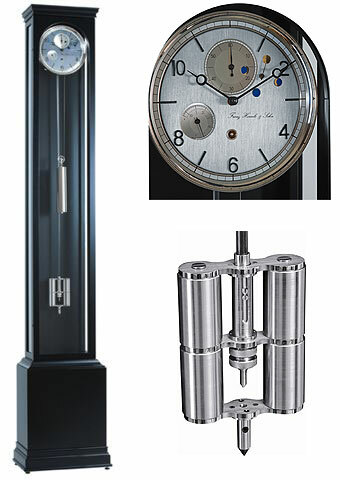 'Hermle Uhrenmanufaktur" made a beautiful, timeless, precision long case clock, a masterpiece for upscale ambiance. The hand polished black finish case in classic design with bevelled glass is equipped with the highest quality clock movement, which has to be wound up only once a month. The "power reserve" during winding keeps constant power to the movement for highest accuracy. The precision movement has 6 ball bearings in the gear system, 2 ruby bushings are used for the third wheel, escape wheel and anchor. The solid graham anchor has 2 rubin pallets. The true second indication will be managed by a 60 step wheel. The operating time of the clock is indicated with a separate hand on the dial and the mooon phases are shown in a easy, self-explanatory way on the dial too. Anchor setting can be done with a precision screw on the pendulum stick. For highest accuracy we also use a carbon pendulum stick with a famous "huygen scher laufer" in a combonation with a double cylinder pendulum. The rare wolfram weight drives the gear system of the movement. The silver coloured circular brushed finished dial marked with a filigran minute track, applied with a black-nickel polished numerals. The hand polished nickel plated bezel is a specific "hermle chamfer", matching perfectly the impressive outlook of the lovely dial. Noble design in harmony with compelling innovation, perfect workmanship and selected materials are a convincing combination and exceeds every customers highest expectation. The attractive grain and well selected veneers distinguish this beautiful and unique walnut grandfather clock. The base contains two drawers as an additional feature. The entablature of this model is of an outstanding design. The highly elaborated dial with crystal glass center and applied brass roman numerals in comonation with suitable weights meet even the highest standard of quality and appearance. with an original certificate. The modern, elegant case with piano-finish makassar wood has bevelled crystal glass on all sides, so you can have a direct view on the complicated westminster bell strike movement with auomatic night shut-off and 11 jewels escapement. The newly developed technique of the eternal calender tells you precisely the the day of thye month, the day of the week, the month as well as the leap year. You therefore do not have to change the date every second month. This brilliant technique is functioning up to the year 2100. Only then, you will have to reset the calender, because febuary 29 does not exsist during that year. The tellurium clock reproduces the annual orbit of the earth around the sun, with the earth rotating around its own axis once in 24 hours. The moon, in turn, revolves around the earth in 29.5 days completing a full rotation around its axis. This allows the reproduction of the different moon phases as they are visable from earth. In the course of one year, the earth passes all 12 zodiac signs, months and individual days which are indicated on the flat disc. 8-day spring wound movement with 4/4 westminster chime on 4 polished bells. Separate second feature, 11 jewels escapement. Polished brass disc has milled zodiac signs and rosettes in addition to the months and days of the year. The tellurium has reproductions of the sun, earth and moon, incorporating the day/month indicator. Please contact our retailers for more information on any of these products.